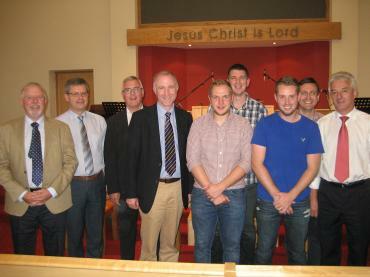 Sunday, 31August 2014 was a special day in the life of Armagh Baptist Church. We had the privilege of appointing two of our young men to Christian service. The morning service took the form of a Family Service as a follow-up to our Holiday Bible Club which had been held throughout the previous week. Aaron Riddle spoke about the boy who gave his lunch to Jesus to be used to feed the five thousand. His talk was the last of the series of ‘Junior Heroes from the Bible’ that the children had been hearing about during the week. Before Aaron got up to speak, Dave Ramsay (Baptist Youth Director) told the congregation about the work of The Amazing Journey - Aaron was starting his new job as Amazing Journey Co-ordinator with Baptist Youth the next morning. Dave then joined with the elders of Armagh Baptist Church as we laid hands on Aaron - Stephen Sturgeon (elder) prayed for him, setting him apart to serve in this important ministry into our local primary schools. Aaron grew up in Newtownhamilton and has been attending Armagh Baptist Church for some time. He and his wife Emma are now members. They are both teachers living in Magheralin, a central location from which to run the Amazing Journey ministry. We wish him God’s blessing for the future. The evening service took the form of a Youth Service. This is something we do quarterly in Armagh, Phil Martin spoke. His message was a challenge to our young people to ‘Expect More!’ – based on Ephesians 3:20. Phil, too, was starting a new job the next morning and before he spoke to us, Edwin Ewart (Principal of the Irish Baptist College) told the congregation about the Ministry Partnership Scheme, recently launched by the College. This is a scheme which provides part-funding for a church taking on a student who has completed the three-year Preparation for Ministry Course at the College. Edwin told us that Armagh Baptist Church is among the first to benefit from this scheme. Phil has grown up through the children’s and youth ministries of the church and is now a member. He has now been appointed to serve part-time as our Youth Pastor for the next two years. The IBC Ministry Partnership Scheme is providing a third of the cost of employing him, and the church makes up the rest. Edwin joined with the elders of the Church as Ian Grant (Pastor) performed the Act of Induction and Alan Abraham (Elder and youth leader) prayed for Phil as he embarks upon this important ministry in the life of our church. It was a joy for us as a church to see two of our own young men set apart for the Lord’s service. Please pray for both of them as Phil serves in Armagh and Aaron works with our sister churches. This report was written by Ian Grant (Armagh Church) and published in abcinsight magazine (Oct/Nov 2014 edition).